The unicompartmental knee replacement should not be confused with the unispacer. The unicompartmental knee replacement has been carefully developed over 50 years of time by many leaders in Orthopaedics. It is not uncommon for patients to develop arthritis primarily on the inside, or medial side, of the knee, especially if they have been bow-legged most of their life. Sometimes the lateral joint is affected in individuals with a "knock-kneed" deformity. In either case of arthritis being on the inside or the outside of the knee, the unicompartmental knee replacement may be used. These have been very successful, and recovery is more rapid than with a full total knee replacement. In younger patients, if the unicompartmental knee replacement wears out, a regular knee replacement can be done with minimally more effort than if no prior surgery had been done. Dr. Clyburn has used several different designs over the years and has had excellent results. In the past few years, the FDA has allowed use of the Oxford Knee, which is a type of partial knee replacement originally used in England. 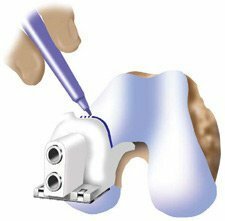 This device has gained worldwide popularity, and it is currently the most commonly used unicompartmental knee replacement worldwide. Dr. Clyburn has been to Oxford, England, to observe the procedure, attended additional meetings in the United States, and has performed the Oxford Knee. This knee is based on a unique design which allows the polyethylene part to move forward and backward, allowing the knee to function in a more normal fashion. So far, his results have been outstanding. Here is a film of the newest unicompartmental knee replacement, the Oxford Knee illustrating the movement of the polyethylene bearing as the knee flexes and extends. This technology is similar to the Patient Specific Guides, but in this case, the MRI is used to produce both the guide and an implant which is specific for the patient. We are excited about this technology and believe it holds promise. The FDA has approved the unicompartmental and bi-compartmental designs, but has not yet approved the total knee design.